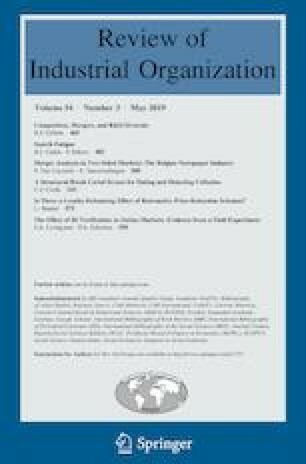 This paper builds a structural model for both advertising and readers’ demand in the Belgian newspaper industry, taking into account cross network effects that exist between advertisers and newspaper readers We combine our parameter estimates with the publishers’ first-order conditions to simulate the impact of a merger. We find a limited impact of the merger on reader and advertiser welfare. The effect on welfare is easily offset by possible efficiency gains. We compare the simulation outcome with the actual outcomes and find—in line with the predictions—no clear aggregate effect of the merger. The responses of individual newspapers, however, differ from the simulation. We thank the editor, two anonymous referees, Filip Abraham, Anneleen Forrier, Lisa George, Joep Konings, Jo Van Biesebroeck, Ambarish Chandra, Gregory Crawford, Jan De Loecker, Lapo Filistrucchi, Damiaan Persyn, Charles Romeo, Ricardo Ribeiro, John Sutton, Pasquale Schiraldi, Frank Verboven, and participants at the IIOC Conference in Savannah, EARIE Conference in Valencia, MIE Spring Camp at KU Leuven, LSE Work in Progress Seminar Series, and IESE SP-SP Luch Seminar Series for useful comments and suggestions. Patrick Van Cayseele has been an expert member of the Belgian antitrust authority and was involved in consulting practice in many merger cases in the Media industry. MediaMarketing. (2004). Hoe Tabloid tot Modules Leidt. Media Marketing, 93. http://www.mm.be/nl/archief.php?id=231. Accessed 10 June 2005.